Great progress at Hawkhurst, the units are nearly ready to hand over. The floors are down, the lights are on and the kitchen is going in! We’ve come a long way from the empty piece of land here three months ago. Some of the recent press coverage about the steel frame building at Hawkhurst, and an article by MD Duncan Murray, “How to Cut Building Costs”. Directline Structures’ Site Manager, Andy Slimm, is pleased with this week’s progess. Four days later and most of the steel frame is up! On a misty Monday morning, the steel frame for the new building arrives. The foundations are in and the steel arrived on two large lorries from the Lindab factory in Luxembourg this morning. Our specialist team of erectors were all ready to start off-loading using a hi-tech JCB fork lift by 9am. Work has started at Hawkhurst Station Business Park with the crushing and reuse of all broken out rubble. This picture shows the pegs marking the building position in front of the old signal box. 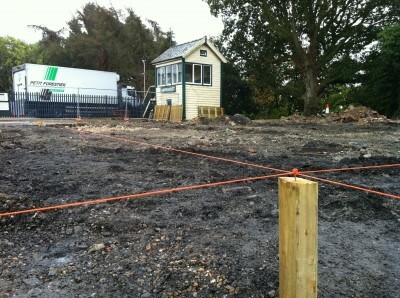 The signal box is being preserved but may be relocated to become part of the Kent and East Sussex Railway.